If you are working with large amount of data and mainly we have use Excel and CSV file format for export data in web development. 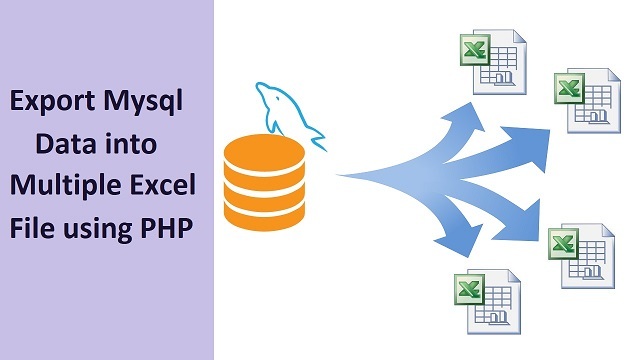 So, in this post we have describe how to split huge amount of mysql datable data and export into multiple excel or csv file by using PHPExcel library in PHP. Suppose there are millions of data in your database, and that amount of data you cannot export into single excel file. At that time you have to divide your data into different files like what we have do in pagination. Like a pagination we have not load all data in single page, but we have divided same amount of data in different page. Same thing we have to do for export huge amount of data into multiple file using PHP script with PHPExcel library. There are number of ways we can export database using PHP script can be done number of ways. But here we will export data into multiple excel file, and that file will be store under folder. By click on link, we can download multiple file one by one. So, here exporting data and downloading file has been divided, so chances of crash of our website will be very less. The output of any web application is to get data in Excel, CSV or PDF format. If you want to make report from your web based application then data must be required in PDF format, but if you want to reuse data in other form, then data must be exported into Excel or CSV format. Because this two format data type is widely used for exchange between two web application. So, here in this post we have make this tutorial for export mysql data into multiple excel file using PHPExcel library in PHP script. Below you can find complete source code of this tutorial. This is index.php file, in this file first we have make database connection, and fetch data from customer table and display on web page. After this we have make form with input select option for select how many records you want to export in single Excel file and below you can find submit button. Once click on submit button then in that block first it will include PHPExcel library. After this first it will calculate how many file want to make from mysql database. After this here object of PHPEcel library has been created and start exporting mysql data in to multiple excel file. Once all data has been exported into multiple files then that file has been stored under folder. These all file download link will be display on web page, and for download file, below you can fine download.php file. SELECT * FROM tbl_customer ORDER BY CustomerID LIMIT ".$start. ", ".$_POST["records_no"]." This file script is used for download exported excel file from folder. Once user click on excel download file then this file script has been execute and it will download particular excel file. Run below SQL script, it will make customer table in your Database.